Instead of the use of any formal manual cross line drawing or printing device, on condition that the genuine cross line measuring work is processed with a high brightness pro red dot laser alignment, it is just making sure of quite convenient and high accuracy dot generation on all desired working surfaces effectively. This 635nm red laser module is keeping direct diode emission from 635nm red laser diode. When it is being made with high attention to environmental stabilization, and being connected with an external DC input power supply, it is just able to work with constant and highly stable red reference dot source generation on all working surfaces effectively. Whenever there is quite accurate dot generation on desired working surfaces, formal triangular meter or blocking board is far more enough to gain ideal dot accuracy as expected. Pro red dot laser alignment is not the same as any other manual or mechanical dot aligning device. It is getting quite high brightness red laser beam from 635nm red laser diode. It is getting similar color laser light with 650nm red laser device, which is getting at least 5 times brighter red light with the same output power. On basis of quite special laser beam mode of TEM00, red alignment laser dot is always available with the most compact diameter, and available with quite nice round shape. According to the selection of high power range of 30mW to 100mW, this high purity beam emitting pro red dot laser alignment is always workable with highly clear and accurate dot instruction at quite long work distance and high lighting working occasion. In order to make sure of superior nice thermal emitting, this laser diode module is being made with 26mm diameter tube, together with external DC input power supply, it is obtaining highly stable dot instruction in long term use. According to quite easy adjustment of laser beam aperture, pro red dot laser alignment is getting quite intense laser beam and the most compact size red reference dot targeting in distance. On basis of quite nice design with electric wires design for both alignment laser and DC input power supply, it is getting free installation distance within maximum distance of 3 meters. Noncontact red reference dot is able to reach any high height, long distance, corner and other hard reaching distance etc. 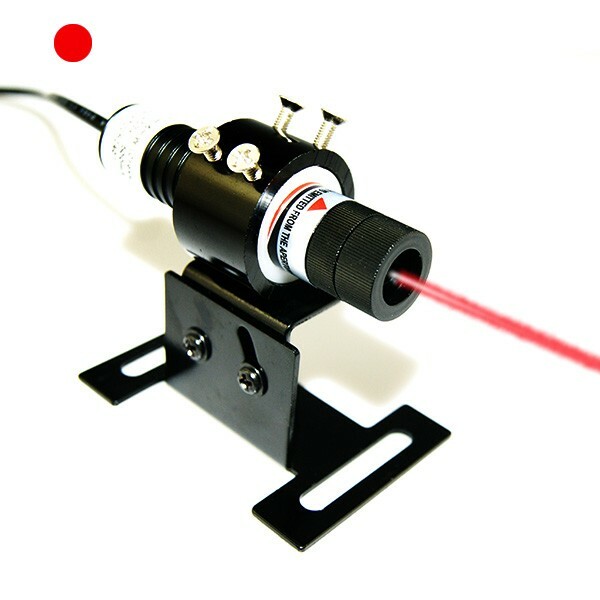 On condition that this red laser module is generating extremely intense red laser light, users should just remember to wear 635nm wavelength preventing laser safety goggles, and then obtaining the clearest dot measurement perfectly.